Whether you spend the late hours of the night and the early hours of morning gaming, long hours of the day working at a keyboard– or both– you probably know the feeling of aching tendons and hurting wrists. Thankfully, some very bright engineers have been hard at work on this problem for some time, and have developed plenty of options for ergonomic keyboard designs. We’ve done the research and narrowed it down to six reviews to help you find the best ergonomic keyboard for your needs. At the end, we even included a short guide to help you understand how these keyboards can help you out. This keyboard uses a split layout that lets you separate the left and right sides of the keyboard as wide as you need, up to 20 inches, to achieve optimal ergonomics. This helps reduce the ulnar flexion that most keyboards cause by forcing your hands to be too close together. This keyboard is also great for gaming thanks to the eight programmable macro keys. In many ways, a split keyboard is arguably better for gaming in fact, since most games only make use of keys like WASD in the case of shooters or a handful of numbers in games like MOBAs. This means you can set aside half the keyboard, and have your mouse closer to your keyboard hand. This is also the only backlit ergonomic keyboard on our list with a nice blue glow for late night gaming or working. Unfortunately, this keyboard cannot be adjusted on its own. The angle is fixed unless you purchase the tenting kit from Kinesis, which lets you put the keyboard at a better angle. The biggest drawback to ergonomic keyboards that often keeps many people away from them is that there is usually a learning curve. In one way or another, most ergonomic keyboards change the layout of the keys, usually by splitting the keys into seperate parts. This change requires you to undergo a period of decreased typing speed and productivity while you adjust to the new layout. Logitech has designed the K350 to avoid this problem. The overall layout of the keyboard remains entirely unchanged, and when looking at this keyboard from above you might barely be able to notice the ergonomic design features. However, when you look at it from the side, you’ll notice the gentle slope of the keys. This wave shaped slope design positions the keys in a more natural manner for your fingers to actually reach, and can actually improve both comfort and typing speed by reducing the travel distance needed to reach each key. This wireless keyboard uses a simple USB dongle and has basically no setup process other than plugging it in. Also, while it would have been nice to see rechargeable batteries used, Logitech opted for using 2 AA batteries that will last for three years before needing to be replaced. One of the things that causes discomfort or even repetitive strain injuries while typing is pronation, which is the act of rotating your wrist so that your palm is facing down. Unfortunately, just an ergonomic keyboard cannot entirely fix this, since you’re still in this wrist posture while using your mouse. Fortunately, there are mice that can fix this, and one such mouse is included with the Microsoft Sculpt. The Sculpt uses a slightly split design that also angles each half of the keyboard slightly inward to reduce ulnar flexion. Each half is also tented up towards the middle to further aid in putting your wrists into a neutral position. While the keyboard itself sports a 10 keyless layout, there is an included number pad that is entirely separate from the keyboard. This lets you lay out your peripherals however you like on your desk, and is especially great when traveling to conserve space. The included mouse might feel strange at first thanks to its odd geometry, but is very comfortable after a couple hours of adjusting. It has a pretty large and shockingly spherical shape to it, and has a thumb groove that is raised to about 45 degrees. This helps put your hand into a more natural posture, almost like a handshake. Unfortunately, this keyboard is not very adjustable. Since the distance between the two split parts of the keyboard cannot be changed, some people might not actually find this particular model very comfortable, so people with larger hands might want to avoid this one. The Kinesis Advantage two is the first keyboard on our list that might look truly foreign to some people. The keys feature a wide split layout and are recessed into a deep keywell. 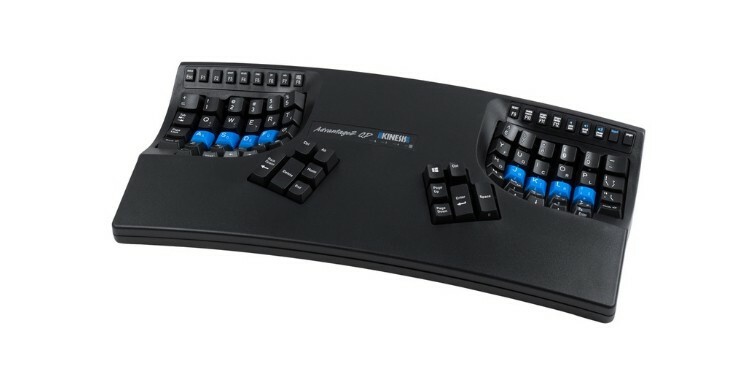 This allowed Kinesis to integrate a considerable curvature into each side of the keys which helps angle your hands into a more neutral position. While this layout is objectively better from an ergonomic perspective, it can certainly take some getting used to. Most people experience a significant reduction in typing speed when they first adopt this keyboard, but can get back to their former speed after a week or so of regular use. As we mentioned with the first keyboard we looked at from Kinesis, they seem to be the only ones using high-quality mechanical switches from Cherry in their designs. This particular model comes with several options including either Cherry MX brown or red switches, and either standard QWERTY or the more unique Dvorak layout that puts the most commonly used keys into the home row. 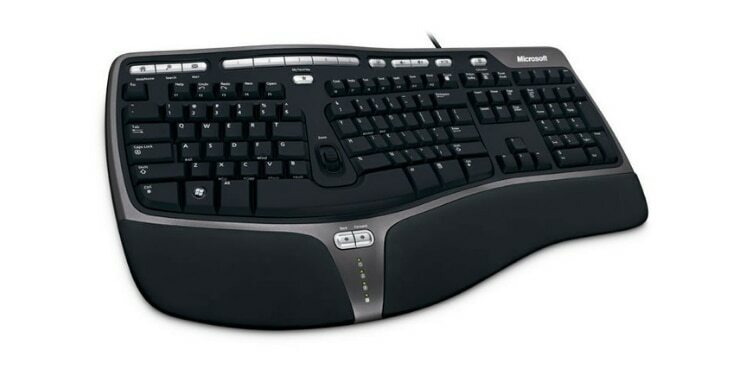 If you’re looking for an ergonomic keyboard for Mac devices, look no further than Microsoft. No. That’s not a joke. 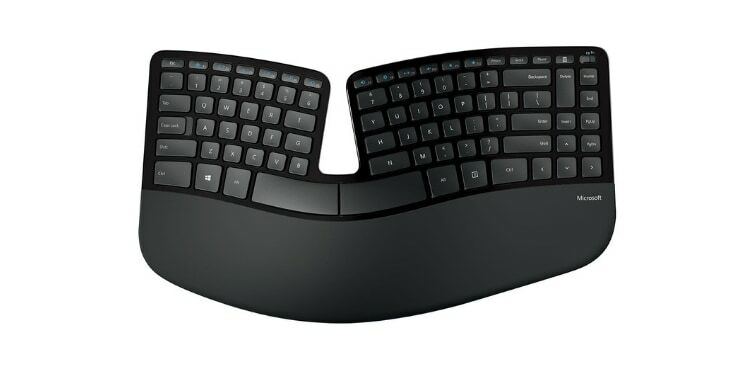 The Microsoft Natural Ergonomic Keyboard 4000-- whose name seemingly comes out of an early 2000’s Disney “sitcom”-- is a nicely curved keyboard that is compatible with almost all devices including iOS, Android, Mac, but oddly not Windows… that was a joke; it does work with Windows. Please laugh. This keyboard is optimized for productivity and boasts tons of small features that make it great for the day to day tasks that make up a bulk of the average person’s computer use. The curvature of the keyboard is comfortable to use, and the slight split requires very little adjustment to use. On the right there is a full number pad for data entry, and at the top there is a row of easy to use media keys for controlling your music while working. 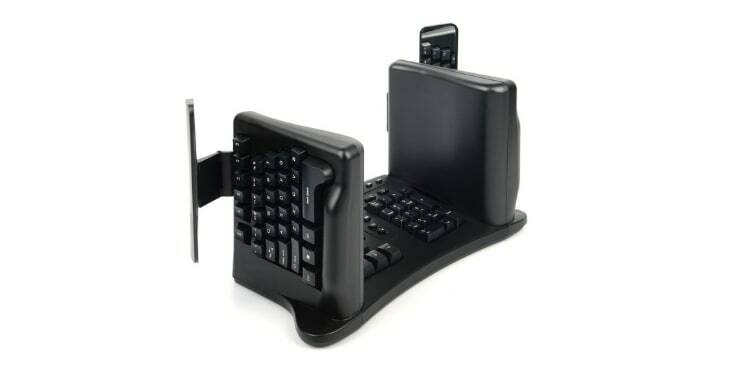 There are forward and backward keys on the wrist rest, and even a scroll wheel like device in between the two sections of the keyboard that makes browsing the web or text documents a breeze. Unfortunately, the switches and keycaps used on this particular keyboard are far from the best. The membrane switches feel mushy and can even be loud when bottoming out, while the lettering has a tendency to rub off over time making this a risky pick for hunt and peck typists. 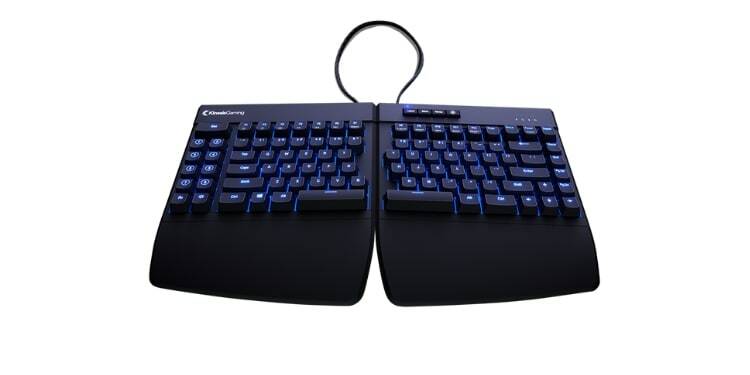 If you’re looking for the most ergonomic keyboard possible that completely eliminates all of the negative posture effects of typing, then this is the keyboard for you. The Safetype keyboard takes the split keyboard design to the extreme and puts the two halves of your keyboard completely vertical. This orientation entirely eliminates extension, deviation, and pronation at the cost of taking quite a while to learn to use. In this position you cannot see the keys you are typing on easily, which is why it comes with mirrors that let you see where you hands are. You know you’ve reached the peak of usability when your keyboard comes equipped with rear view mirrors. For most people it can take a couple of weeks to a month to adjust to this keyboard, but you will regain most of your typing speed by the time you’ve gotten used to it. If you have a nagging repetitive strain injury, then this could really help you out. 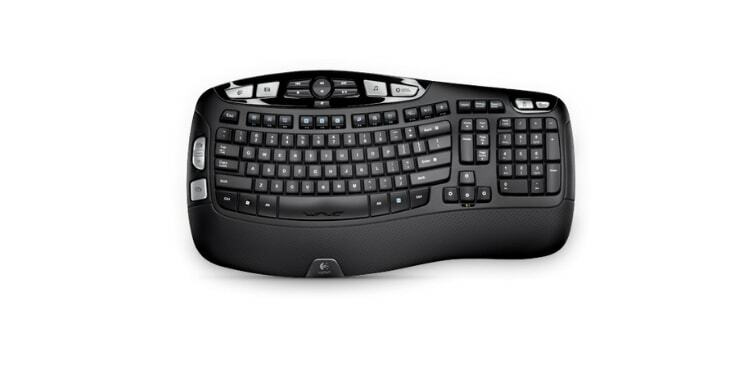 Despite the steep price and initially awkward layout, you’ll find very few people online saying they didn’t get their money’s worth from this keyboard, or that it didn’t help with their wrists and tendons. In fact, this is a great keyboard for those who have just had a shoulder surgery or other surgeries that interfere with typing and posture. If you’re still unconvinced, then check it out in action. Using a keyboard all day can cause people to develop repetitive strain injuries, or RSIs. This is because the way you sit at your desk, at your keyboard, and specifically the way you have to rest your hands on a traditional keyboard, is pretty unnatural. While a neutral hand position is ideal, most keyboards force your wrist out of neutral alignment in the three ways that we’ll look at now. If you’re interested in knowing more about what else makes a good keyboard, then check out our keyboard guide. It has 10 of our favorite keyboards at the top, but it also has a more detailed guide down at the bottom. Before we start talking about all of these other things, it’s important to define what is considered to be neutral. When you think of how you walk or shake hands, your palms are held parallel to your body. So, if your arms are by your side, your fingers would be pointed towards ground. If your arms are lifted and forward, then your fingers would be pointed forward with your pinky down and your thumb on the top. These are perhaps the easiest to understand. Supination and pronation involve you rotating your forearm. When supinated or pronated, your hands are turned so that your palms are facing either towards or away from your body. In the case of most keyboards, your hands and wrists are pronated meaning your palm is facing down. This actually twists the two bones in your forearms over one another which can pinch the tendons and cause carpal tunnel in some cases. Keyboards like the Safetype are designed to eliminate this and put your hands into the more natural “handshake” posture. Flexion and extension describes upward and downward movement in the wrist. Flexion is when the wrist is bent downwards, pushing the palm towards the wrist. Extension on the other hand, is when the hand is pulled upward raising the back of the hand towards you. Keyboards can force you into flexion or extension depending on your seat and desk level as well as whether or not your keyboard is raised. Ideally your chair should be at a level where your forearms, wrists, and hands can form a straight line. Most of the time this kind of posture causes discomfort in the tendons in the back of the hand and/or wrist. Finally, we have ulnar or radial deviation. These describe side to side movement of the wrist. This is also called ulnar flexion and refers to the way you have to angle your hands outward at the wrist when typing on most keyboards. This can be eliminated by using a split keyboard like the Kinesis Freestyle Edge, which allows you to put each half of the keyboard as wide apart as necessary to prevent the need to bend your hands at the wrist.